Looking to revamp your home but on a budget? You can decorate your home for less with these dollar store DIY projects. Below are some creative home decorating ideas using items found at your local dollar store. Here are 13 dollar store home decor ideas you’ll love! Adding fresh herbs to this terracotta pot is a genius idea! 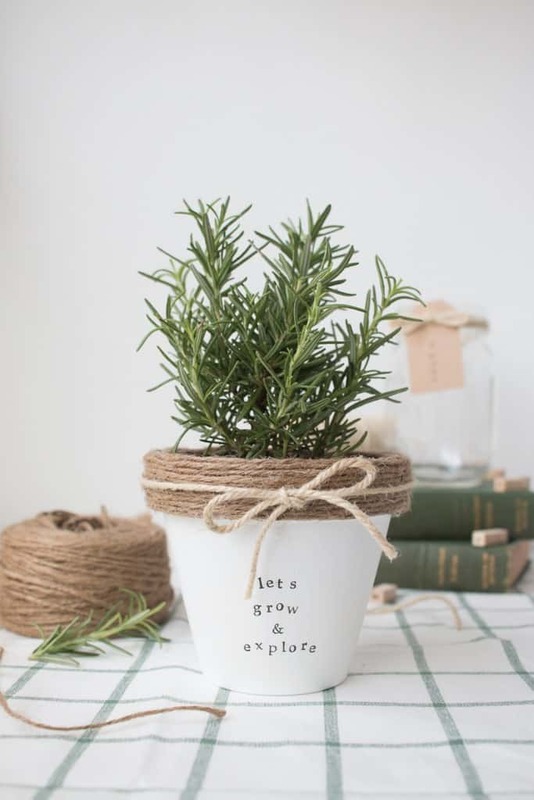 These adorable terracotta pots would make the perfect home for your fresh herb garden. Add some sparkle to your home decor with this dollar store DIY! This sparkly project is also so chic for wedding decor or your next party. Create a beautiful flower garland this spring and hang with other art to make a beautiful wall display. Such a creative yet meaningful project that’s perfect for holidays, celebrations, and centerpieces. This ocean stone bath mat is a great way to incorporate nature into your bathroom. Even perfect if you’re a beach lover! This tall succulent planter looks so pretty and fresh. Such a fun tutorial to do and I can see myself placing it in my office. These modern hanging wall planters is a great dollar store project to do this spring! This DIY Floral Mouse Pad is such a cool idea for spring. I totally love the pastel colors + flowers! In her tutorial, she creates 3 vase makeovers but this fun and geometric one is my favorite. Very modern and chic! Create a beautiful centerpiece made with succulents for your dinner table using items from the dollar store! Add a little glamour with this DIY Mirror Boxes tutorial. Can place anywhere like on a bookshelf, coffee table, kitchen window, or side table. An easy yet beautiful project inspired by Pottery Barn’s Tiled Mirror. This tutorial is a great way to get the look for less! This tutorial shows you how to make beautiful ampersand art using thumbtacks and other items from the dollar store.